There we were at an awesome birthday party with the World’s Best Balloon Twister, and the Boo was completely uninterested in the guy’s insane skills. Me: He can make anything for you! Anything! What would you like? Boo: When are we having cake? Ten more minutes go by. The World’s Best Balloon Twister announces last call and I laugh, thinking about what that used to mean to me. 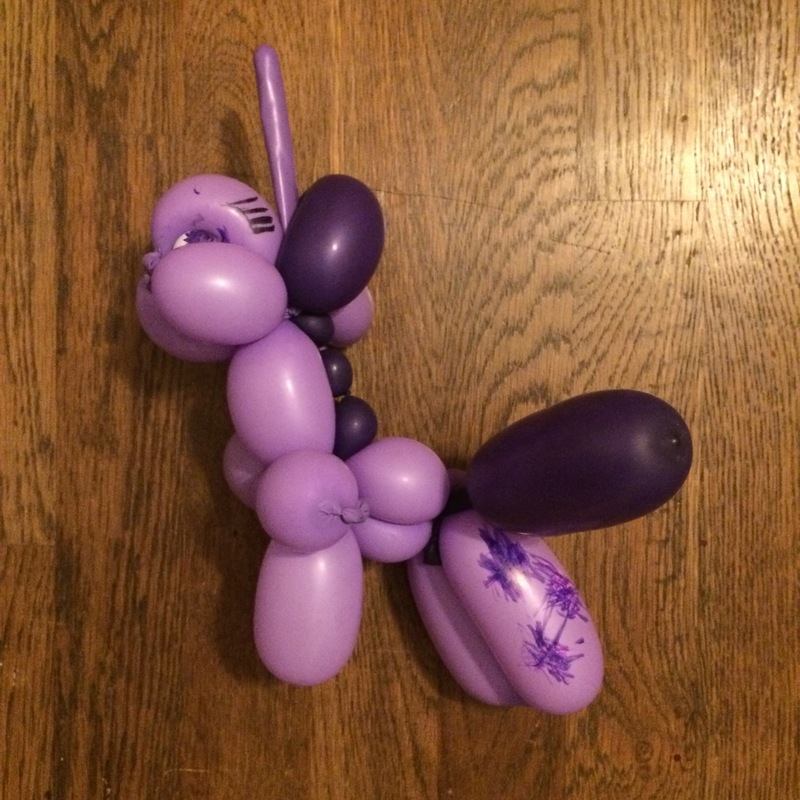 Me: Honey, seriously, if you want a balloon animal now is the time! Boo: Is it time for cake yet? Me: Sounds good. Just go tell him what you want. Boo: Can you do it? People, I did it. I delivered my kid’s balloon animal order so he could continue obsessing over cake and running around like a lunatic. And the World’s Best Balloon Twister did an awesome job, and the Boo loved that thing. I mean, really loved it. Slept with it. Brought it down for breakfast. Watched My Little Pony with it. But still, he loved on it and insisted it be tucked in with him for rest time and bed time. He redid the thing’s cutie marks, as you can see in the photo above. 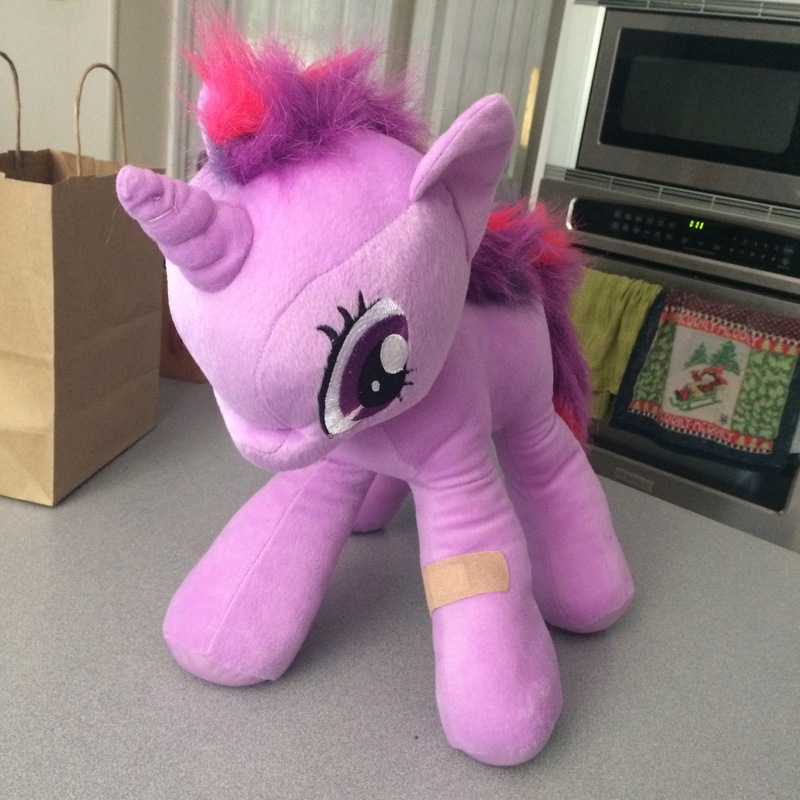 And then it began to look so sad that I thought about getting him a replacement because his love for Twilight was strong and true even though she had become somewhat revolting to adult eyes. I scanned a few options online and then got distracted by dishes/laundry/cooking/childcare. But then, as I was trolling the aisles of Target, I saw it. 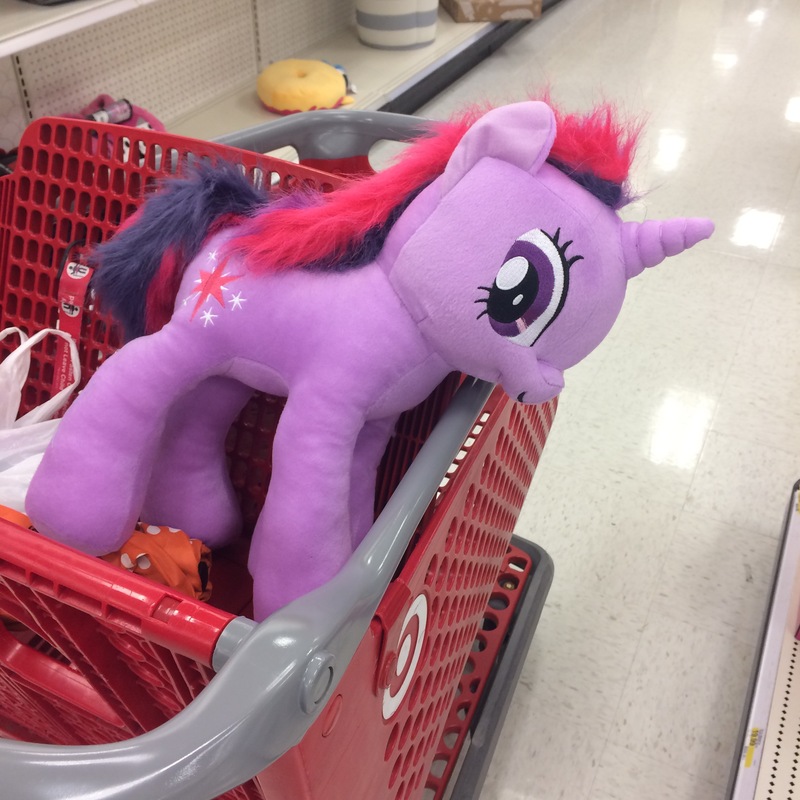 One lonely Twilight Sparkle among a herd of Rainbow Dashes. I googled “twilight sparkle cutie mark” to confirm I had the right one, and then nabbed it. I put it in the Boo’s booster seat just before summer camp pick-up time and told him I had a surprise for him in the car. Biggest. Smile. Ever. Followed by the sweetest, most sincere thank you. The only downside to this story: Now he wants me to get all the other ones for him.